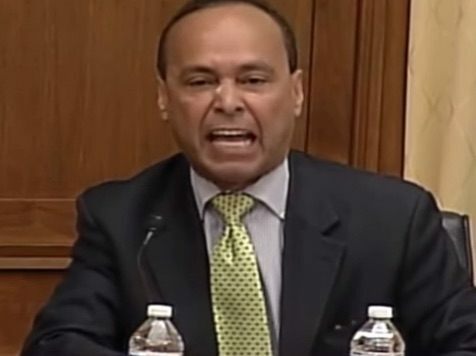 Democratic Rep. Luis Gutierrez used his time testifying before the Senate Judiciary Committee on Tuesday to furiously denounce the Center for Immigration Studies’ Jessica Vaughan, after she turned his dismissal of Kathryn Steinle’s murder as “a little thing” against him. Vaughan, Director of Policy Studies, testified about the dangers sanctuary policies pose to Americans when local jurisdictions refuse to hand over illegal aliens to immigration authorities, or even detain them. Vaughan continued, “I have a friend. Her name is Heather. A few years ago, she was carjacked at knife-point and taken to Roger Williams’ Park in Providence, Rhode Island, and raped repeatedly by an illegal alien who had been in the custody of the Providence Police Department more than once,” but was released thanks to a mayor’s sanctuary city policies. About three minutes into his testimony, he asked to re-read a statement he made at another hearing. He began to read in an increasingly angry tone. “I just want to, just for the record, because I think it is very important –” he paused, glaring daggers at the audience, likely at Vaughan. “Listen to this,” he demanded, with another pregnant pause. He then read aloud a statement he made during a July 14 hearing. This was a deeply disingenuous thing for Gutierrez to say about Steinle’s murder: In English, he said he could “only imagine the grief her family is feeling” on the Congressional record. One week later, he said in Spanish her death was “a little thing.” Politicians talk out both sides of their mouth, but thanks to mass immigration, the U.S. can see its elected representatives do so in different languages. Gutierrez accused Vaughan of “exploiting” Steinle’s death by pointing out that defiant local authorities refused to cooperate with immigration law enforcement, and that Gutierrez himself scoffed at her murder. Gutierrez, always audacious, adopted Steinle’s murder as a way to plug his own political career. That Americans have lost beloved family members to illegal aliens made no impression on Gutierrez. He demanded Vaughan stop talking about immigration altogether. “You should find a more decent and practical way about going about your living,” he shouted. And then Gutierrez turned to her grieving father. “That has been my record in the past, in working with the members of the minority and the majority in this House. And I take great offense at anyone suggesting otherwise,” he concluded. Email Katie at kmchugh@breitbart.com. Follow her on Twitter: @k_mcq.